Bankim Pathak (Bankim Pravinchandra Pathak) was born on 3rd July, 1948 at Ahmedabad. His father was also a well known folk singer. From his childhood Bankim Pathak was very much inspired from his father. During his school days he was also supported by his principal Mrs. Jayaben Patel. She was always encouraging him to sing in daily prayer and other small functions in the school. After completing his school he joined St. Xavier’s College and made his graduation with B.A. in the year 1969. Between 1966 to 1969 of his college life he always used to sing a song of his favorite singer Mohmad Rafi in almost all functions. 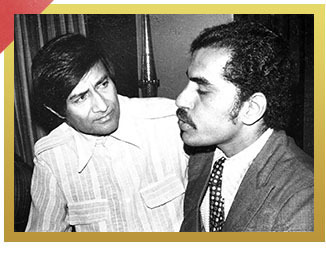 He was known as “Voice of Rafi” in his friends and social circle. Bankim Pathak took his primary training of music from Shri Navinbhai Shah and Shri Krishnakant Parikh (Radio Artist). But than after he take a basic voice cultural training from Pro. Sudhir Khandekar and brought up with a real voice – Today Bankim Pathak is truly saying that, he was totally uplifted only by Pro. Sudhir Khandekar and Shri Sharad Khandekar (Orchestra Khandekar Brothers). In the year 1969 “Visarata Sur” fame Shri Ambrish Parikh gave first break to Bankim Pathak as a professions singer in his banner. 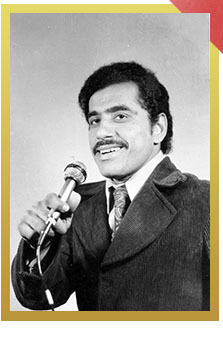 From the year 1976 to 1980 he started to perform with orchestra Khandekar Brothers as a leading singer and he became more experienced singer. But the story begins now….on 8th April, 1980, Jaishankar Sundri Hall, Ahmedabad – Bankim Pathak performed his first one man show with female singer Anila Gohil under the banner of “Bankim-Anila Concert”. The program get unforgettable response from all music lovers and fans of Shri Mohmad Rafi. On public demand from other cities several show were also performed in Surat, Navsari and Baroda also and Bankim Pathak brought out his real identification as a Voice of Rafi. 31st July, 1980 – Mohmad Rafi passed away from us. All the music lovers were shocked. They felt very alone and sad without Rafi Saab’s voice. Just after six months from Rafi Saab’s death in January, 1981 Bankim Pathak started his own title – “EK YAAD RAFI KE BAAD” (Bankim Pathak Night with Anila Gohil) and performed all over India and made his perfect place in the heart of Rafi Saab’s fans and let them realize that they are not alone, they can be enjoy Rafi Saab’s voice again – by the medium of Bankim Pathak. Bankim Pathak made his first tour of abroad in May 1981 of U.K. In this tour he perform 10 successful shows of “EK YAAD RAFI KE BAAD”. As 1981 is the year of the disabled and as Bankim Pathak is a disabled person himself, he arrange one charity show for the same and collected and given f 33,000 (Approx. Rs. 6,60,000) to St. Merry Children Hospital, London. This was appreciated all over UK and India. After this successive tour Bankim Pathak performed all around the world. Today in his most of overseas tours he gives one charity show for disabled. Bankim Pathak never forget the encouragement which was given by his Father, his wife, his family members-friends. He was also especially thankful to Pro. Sudhir Khandekar & Shri Sharad Khandekar (Orchestra Khandekar Brothers), Shri Mahesh Kanodia & Shri Naresh Kanodia (Mahesh Kumar & Party), his organizer Mr. Mahendra Shah (Surat) and all of those who are directly and indirectly contribute in his success. Till today “EK YAAD RAFI KE BAAD” performed more than 3500 times throughout the entire countries including almost all the main centers of Gujarat, Rajasthan and Maharastra. Multinational companies, Government sectors and International organizations like Lions Club, Rotary Club, Jain Social Group of major cities are always preferred to arrange live concert of Bankim Pathak. Bankim Pathak has performed with more than 80 well known female singers of Gujarat & Maharashtra. He sing highest songs with Anila Gohil and second highest with Daksha Gohil. Right now Daksha Gohil is a leading female singer in his group since 1981. Today there are a millions of music lovers are in Ahmedabad, Surat, Mumbai, Madras, Banglore, Calcutta and Pune – who are eagerly waiting for Bankim Pathak’s live concert to enjoy Rafi Saab’s evergreen songs. Ek Yaad Rafi Ke Baad © | All rights reserved.